'French Spider-Man' Arrested After Scaling London Skyscraper Without Ropes A man who has climbed many of the world's tallest buildings has done it again, this time in London. People watch as French urban climber Alain Robert ascends the 46-story Heron Tower in central London on Thursday. A man who calls himself the "French Spider-Man" illegally scaled one of London's tallest buildings without any ropes or safety gear on Thursday and was promptly arrested. Alain Robert scrambled up the side of the 46-story Heron Tower as police cordoned off the building, closed roads and ushered away spectators, according to the Associated Press. The 56-year-old has climbed many of the world's tallest structures, including the Empire State Building, the Eiffel Tower and the Burj Khalifa in Dubai. A few spectators captured videos of his most recent feat, which they posted on social media. One user tweeted this video of Robert beginning his ascent. In this video, Robert seems to be nearly halfway up the building as someone is heard in the background telling people on the street to back up. When he reaches the roof, Robert throws up his hands in celebration to the sound of cheers. He then ducks under a safety railing as two men wait for him on the other side. The three can be seen talking while several other men walk up an interior staircase and out onto the roof. The City of London Police arrested Robert, saying he caused "a public nuisance." "Our officers, the London Fire Brigade and the London Ambulance Service all attended this incident taking them away from genuine emergencies," Commander Karen Baxter said in a statement. 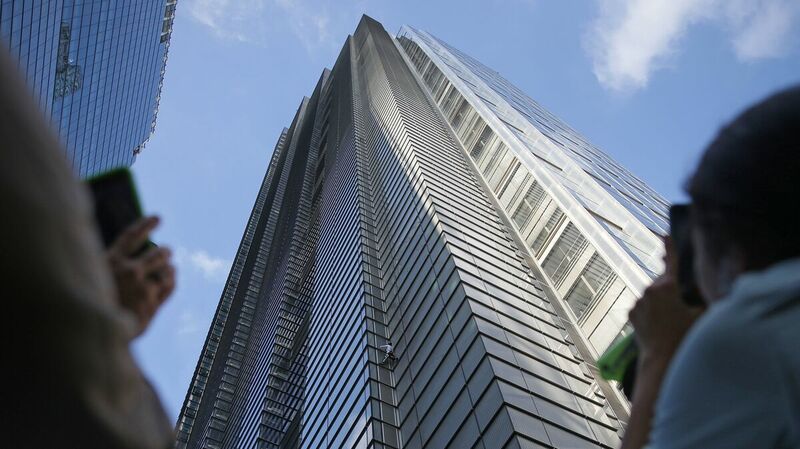 "While the incident has caused immense disruption to everyday business in the City of London, it also posed a significant level of risk to the safety of people in and around Heron Tower at the time." On Friday, Robert pleaded guilty and was sentenced to 20 weeks in prison, which was suspended for two years. He was ordered to pay a fine of about $7,000 and was barred from climbing any building in the U.K. until further notice, according to police. "Today's result at court should act as a deterrent for anyone thinking of participating in a similar illegal act," Baxter said. "You will be subject to a criminal investigation, the result of which may well result in you having a permanent criminal record." Like the scaling of Heron Tower, most of Robert's climbs are done without permission, and he has been arrested multiple times in various countries. "What I am doing may seem crazy for most of the people, but not in a bad way," he told Sky News before Thursday's climb. "Overall, I climb to succeed, and my target is going at the top and, of course, to stay alive." "I didn't even really know about this building," he told the U.K. news service. "I only saw some pictures before I came to London two days ago."